The weather might still be warming up but New York’s whitewater rapids are ready to go! Unlike summer, when rivers dry up, spring is when you’ll find powerful water flow, which creates the most exciting rapids. Head to the Black River Canyon near Watertown, where the Whitewater Challengers outpost will get you set up. Water courses through the canyon walls, churning up as it goes, making for a wild ride. If you’re looking to extend the adventure, stay overnight at the nearby Black River Bay Campground and come back for a second day of rafting. 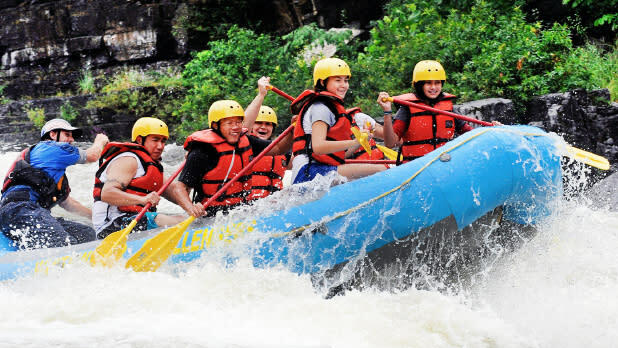 Every trip with Whitewater Challengers includes cookies and lemonade to enjoy on the water, and ends with an outdoor cookout as you process the scariest, most thrilling moments. 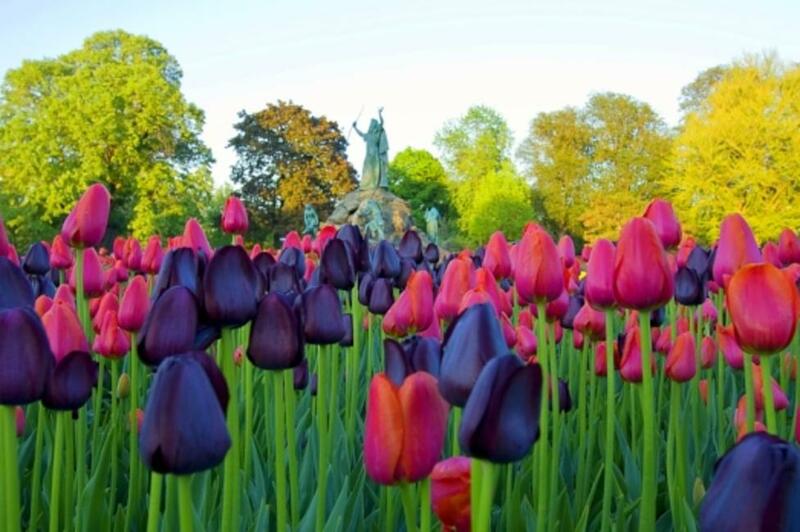 You have until April 28 to stop and smell the 22,000 bulbs on display at the Buffalo and Erie County Botanical Gardens’ Spring Flower Exhibit. Nestled among the plants are beautifully handcrafted metal sculptures, poking up almost like organic creatures among the flowers. Your kiddos will love the Mini Farm, where they can meet its resident bunnies, chicks, and ducklings. They’ll also enjoy special appearances by the Easter Bunny! Don’t go chasing waterfalls—unless you’re in New York, that is! New York has some absolutely stunning and very accessible falls, and spring is the best time to see them at their most active. Of course, there’s Niagara Falls, an experience that surpasses the hype. 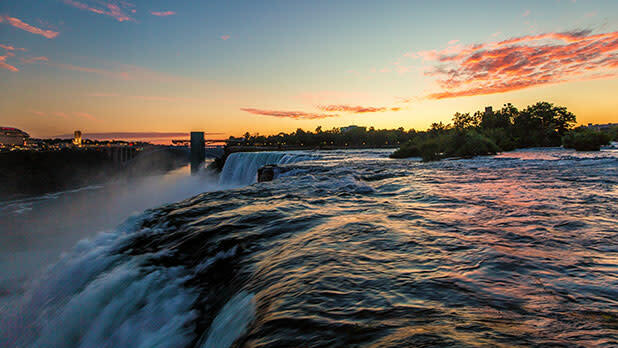 Make the most of it by exploring Niagara Falls State Park and all its trails and magnificent views. You’ll also find spectacular falls in Letchworth State Park, the “Grand Canyon of the East,” and an incredible man-made waterfall in Croton Gorge Park in the Hudson Valley. Don’t forget the more than 150 waterfalls within 10 miles around the city of Ithaca! Don’t let April (or May or June) showers spoil your fun. Strong National Museum of Play in Rochester is a blast and large enough that you can easily spend a day exploring the exhibits. 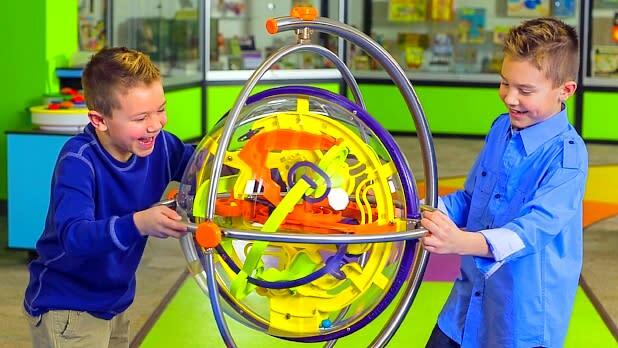 There’s something for all ages, from an enormous play grocery store to giant Etch-a-Sketches, obstacle courses, arcade games, and more. 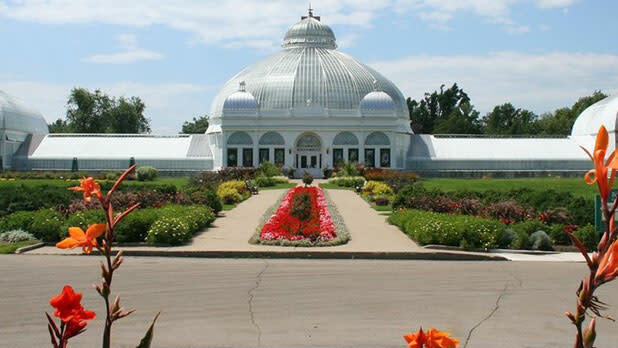 Enjoy nature in the 80-degree butterfly garden. Alternatively, there’s Destiny USA in the Finger Lakes. This mega shopping mall/theme park hybrid not only hosts every store you’d ever want and 50 different places to eat, you’ll also find a full-size indoor go-karting track, the world’s largest indoor suspended ropes course, a spacious comedy club, and so much more. It’s okay, rain, you don’t have to go away. Sunday, May 12 is Mother’s Day and we’ve got the perfect gift to show mom how much you cherish her. 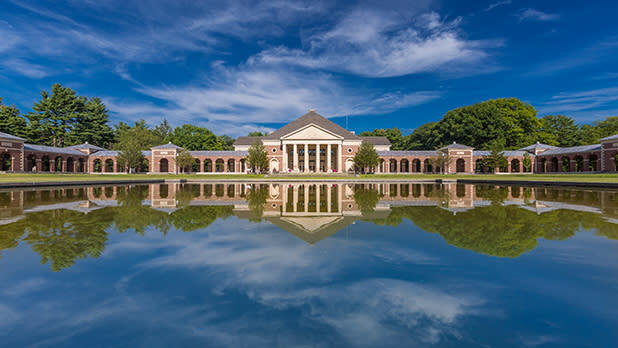 First of all, Saratoga Springs is the perfect destination to take a stroll through the charming downtown, hike through the woods, or check out the local art museums and parks. Cap it off with the pièce de résistance, a visit to Roosevelt Baths & Spa. Sign up for mineral baths in natural Saratoga spring water, massages, facials, scrubs, and body wraps in this luxurious oasis of relaxation. Mom deserves it! Sculpture, nature, and architecture, oh my! Art Omi, the 120-acre sculpture and architecture park in Ghent is the perfect venue to enjoy the warm weather and wake up your senses. 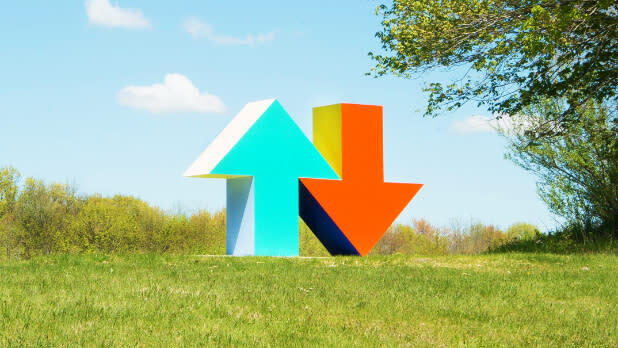 Larger-than-life sculpture pieces scatter the wide open fields, begging you to pose and play with them. You’ll also come across amazing architectural works, like a small room with colorful glass-paneled walls sitting delicately on a pond. And if you can’t get enough outdoor sculpture, the Hudson Valley’s other famous sculpture park, Storm King is open for the season. Get up, get out, and get...underground? Yep! Trust us on this one, there is so much beautiful scenery waiting beneath the earth’s surface, like at Howe Caverns, where you’ll travel 156 feet underground to a labyrinth of twisty, turny rock corridors. 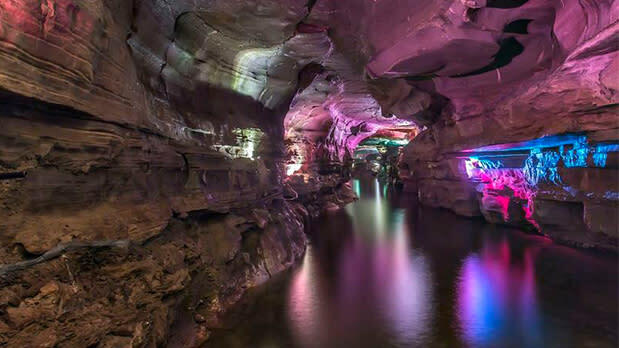 Colorful lights illuminate the caves, reflecting off the pool of water at the bottom, the “River Styx.” Up in the Adirondacks, at the Natural Stone Bridges and Caves, you’ll find nature trails, waterfalls, and the largest marble cave entrance in the eastern United States. The cave opens for the public starting May 17, so get ready to discover the lighted grottos and pools of water inside. 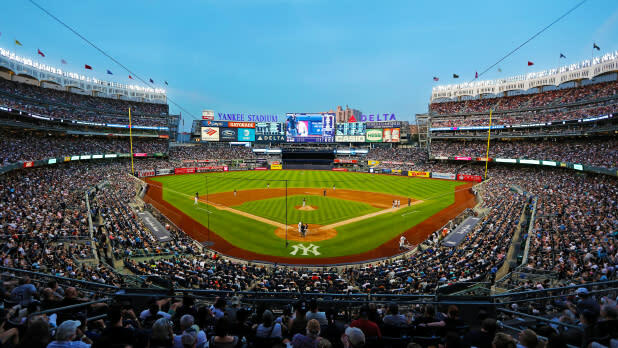 Baseball season is in full swing and New York has no shortage of exciting games coming up. Hopes are high for the Yanks and Mets this year. Good seats will be in demand, so book your tickets now! But remember, the Major League teams aren’t the only games in town. Many minor league teams throughout the state are filled with incredible talent on their way up to the big show. Catch the Buffalo Bisons, the Rochester Red Wings, or the Syracuse Mets, the new Triple-A affiliate of the New York Mets, and have a family-friendly day at the park! There’s no one season to believe in fairy tales, however, the season to visit real-life castles is back. 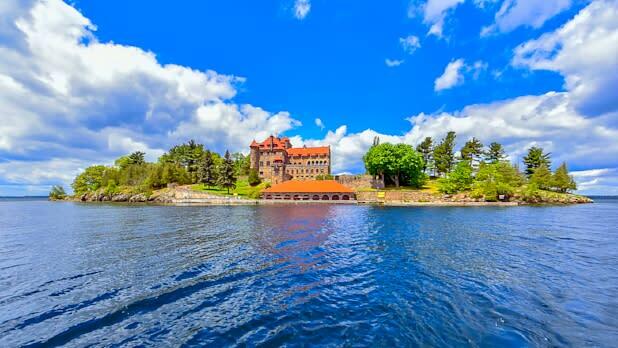 Starting mid-May, take to the seas and island-hop the Thousand Islands region, stopping at two historic castles. Both Boldt Castle, the family home of George C. Boldt, and Singer Castle, former home of the president of the Singer sewing machine empire, inspire awe with their architecture, design, and remote locations. Both mansions offer guided tours of the rooms and collections, and the views on the boat ride along the way are outstanding. Get your marshmallows, graham crackers, and ghost stories ready! Camping season begins for most areas of the state on May 17 (check here to make sure of dates for your particular destination). 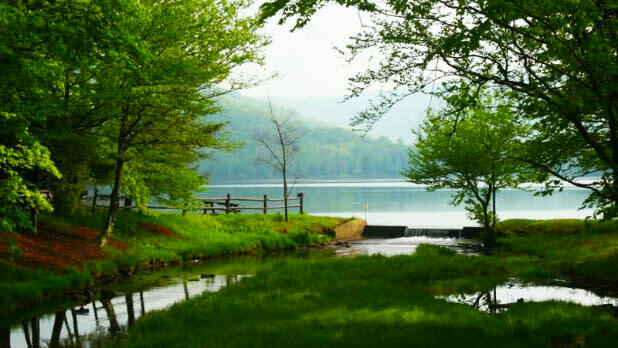 Head to Mongaup Pond in Livingston Manor to camp along the largest body of water in the Catskills outside of those that provide water for NYC. It&apos;s a fairly remote spot to unplug for a bit and reconnect with nature after a long winter. You&apos;ll find dense forests, wooded campsites, and a picnic area. If the lake water is too cold for swimming, BYO boat or rent one onsite to get out in the water another way. Fishing enthusiasts will find brook trout, golden shiners, yellow bullheads, and more. There&apos;s a 1.5-mile hiking loop within the campground itself or serious hikers can connect to the Big Indian Wilderness and Willowemoc Wild Forest trails. This year marks the 50th anniversary of Woodstock! Bethel Woods Center for the Arts, on the site where it all began, can be your portal to that epic summer. The museum has just reopened with a special exhibit on the festival, We Are Golden: Reflections on the 50th Anniversary of The Woodstock Festival & Aspirations for a Peaceful Future. 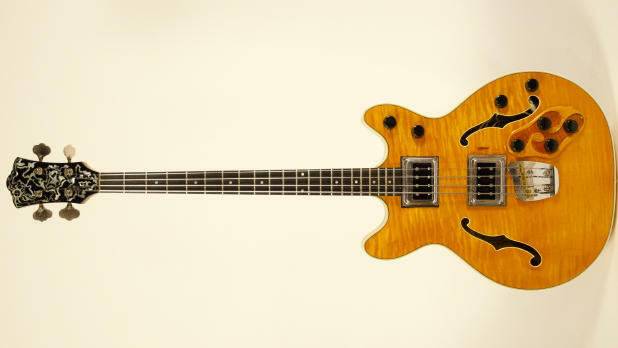 It offers a moving collection of photographs, as well as other memorabilia such as guitars, lyric sheets, t-shirts, and more. There are also events happening all through the season, like the reopening of the "Bindy Bazaar" trails where festival-goers bought crafts and clothing. Every Saturday between April 13 and May 11 the Center will hold music, printmaking, sculpture, design, and theater classes for children, and May 17 to 19 you can attend Lunar Weekend, a celebration of the 1969 moon landing. The weather is warm but not too hot, trees are full of green leaves, and grassy fields are plush. What better way to enjoy the season (and life) than sipping a glass of delicious wine at vineyards all throughout Lake Erie Wine country? 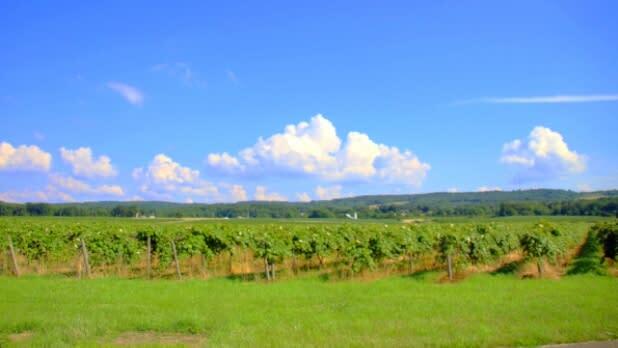 The area contains 23 wineries within 50 miles, all open to the public. Most charge a small tasting fee of $1–5 to try wines, which some may deduct from the price of a bottle if you buy one. Find a complete listing of the wineries on the Lake Erie Wine Country website so you can map out your itinerary in advance. 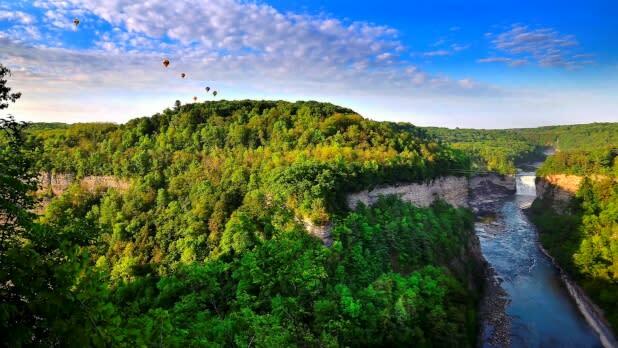 One of New York’s most beautiful natural settings, Letchworth State Park, takes on an exceptionally ethereal quality as 25 enormous hot air balloons take to the sky six times a day between May 26–29. That’s the magic of the Annual Red, White, & Blue Balloon Rally. The sight will be beautiful to watch from the ground as balloons float over the gorge, but if you’re looking for the experience of a lifetime, consider taking a ride! Call as soon as possible to inquire about availability for the rally, or for any day between May and October. Let us paint the perfect Memorial Day weekend plans: a trip to a sandy beach on Long Island&apos;s Jones Beach with an amazing view of jaw-dropping entertainment—all you have to do is look up! 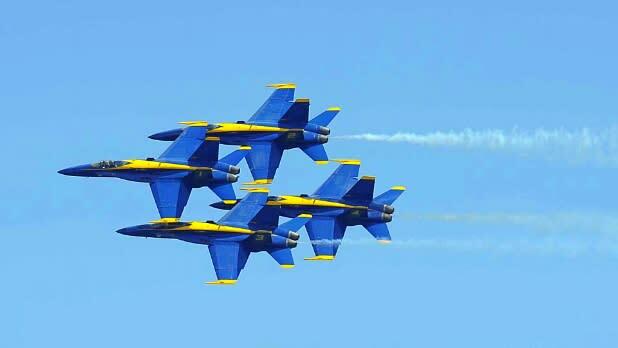 The annual Bethpage Air Show features world-renowned military and civilian pilots performing tricks with unbelievable agility and synchronicity. It’s a popular—and free—event, so pack your blanket and some snacks and head to the beach as early as you can to claim your spot! One of the best perks of spring is once again being able to dine al fresco, and New York State has so many places to eat with a view where you can whip up some BBQ on Memorial Day. 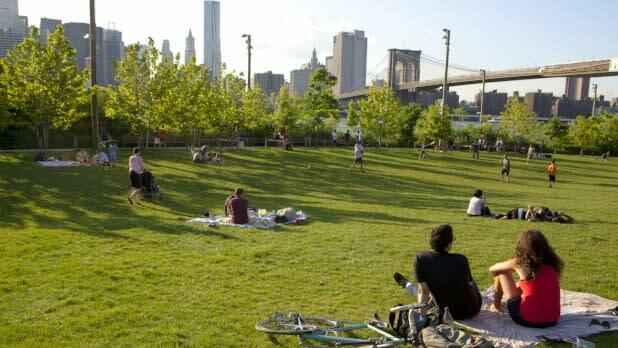 Brooklyn Bridge Park has grills, benches, umbrellas, and a view of the Hudson River. Indian Island County Park on Long Island lets you set up near the Peconic River, with tables, grills, and a nearby farm with peacocks, goats, and other animals. 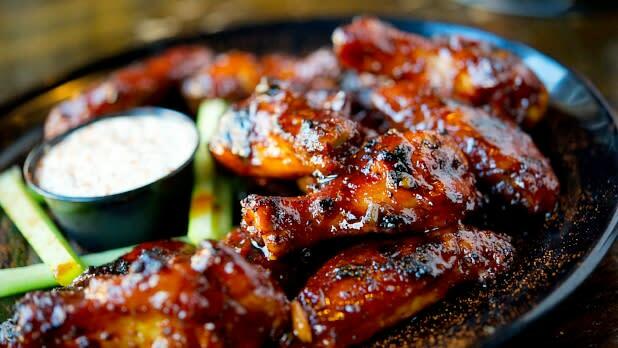 The Million Dollar Beach at Lake George will be a happening spot, thanks to its sandy shore and ample grill stations. And of course, if you can do without the barbecue, just find a New York State Park near you and enjoy your long weekend!